I am typing this up as I munch on candy corns. 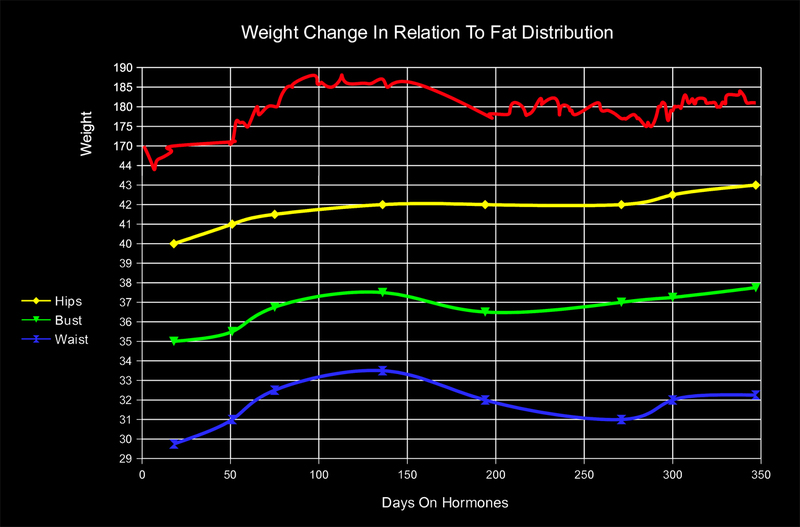 Today I put together an updated version of my fat distribution chart. It took me longer than I expected because there is no real easy way to convert an excel chart into an image file. I am using Libreoffice Calc and I just ended up exporting as a pdf file and then I opened it in photoshop. The lines and text came out more gray than white, I adjusted it as best as I could for the time being. I also updated my breast growth timeline and it can be seen over on the Breast Development page. I am pretty excited about the amount of growth I am finally getting. I see my endocrinologist tomorrow at 12:40pm and he should raise my dose to 4mg of Estradiol. I am going to ask him about taking it sublingually as I’ve heard of many girls doing the same. I am curious if one less pass through the liver makes a huge difference.